If you even whisper the words “This Is Us” into the social media air, you will receive an emphatic response from the masses. The hit show has stolen the hearts of millions upon millions of TV watchers and anyone who enjoys a good ugly cry. This Is Us tends to make everyone on Twitter incredibly emotional. Its portrayal of life, death, love, grief, family, and all the emotions of being a human is so moving. It even has a way of making us wary of our Crock-Pots and our smoke alarm batteries. If that’s not influential, we don’t know what is. If you have yet to watch This Is Us, you have probably at least picked up on the intense emotional reactions viewers have to it. The show is full of heart, sadness, and love. Similar to shows like Parenthood, it’s easy to understand why everyone is so obsessed with it. We all love a good cry and the cast is so perfect that it’s hard to not fall in love with the show upon first viewing. Milo Ventimiglia, Mandy Moore, Sterling K. Brown, Chrissy Metz, Justin Hartley — should we go on? 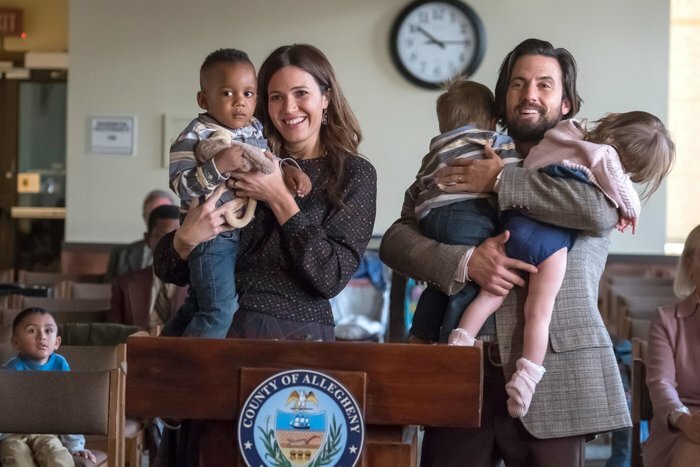 Since its premiere in 2016, This Is Us has been a huge hit. Especially on social media, where everyone enjoys live-tweeting and expressing their feelings when literally anything happens. So, imagine the excitement when a powerhouse celeb like Kim Kardashian casually mentions that she started watching This is Us. Kim Kardashian’s tweet about This Is Us did not go unnoticed. Not that anything Kim Kardashian does goes unnoticed, but you feel us. She tweeted about the show on February 21st and already has thousands of responses from fans encouraging her to watch. I’m starting to watch This Is Us. Who watches it? Is it good? Among the fans include the cast of the show, of course. The Big Three all responded and gave their two cents. Well, sort of. Justin Hartley, who plays present-day Kevin Pearson, was quick to suggest that Kim stick with it. Mackenzie Hancsicsak, who plays little Kate Pearson, agreed. And offered up her babysitting services too! Niles Fitch, who plays teen Randall, joked that he’s heard good things about This Is Us too. But This Is Us itself had the best response, warning Kardashian that the show will make her sob by using HER OWN FACE. Slow clap, This is Us. Hey, there’s no denying this show has something special. If the Kardashians are going to get into it, that makes it even more exciting. Who doesn’t want to live tweet their favorite show along with the Kardashian family? Oh, This is Us. What did we ever do without you?